The leaves of this European plant are a grayish-green color with soft, velvety hairs. Common mullein is a biennial. In its first year, it grows leaves in a basal rosette It sends up a flower stalk and produces seeds in the second year. Most of the flowering mullein plants I’ve seen have been a respectable 3 to 5 feet tall. The specimen in the picture measures 8 feet tall! Verbascum thapsus produces many seeds (between 100,000 and 180,000 per plant) that can remain viable for a hundred years or so, but it is rather picky about its environment. It likes sun, and seed will not grow if it is covered in shade. The plant does not like to get crowded, and you will most likely find it in open spaces in barren ground. The quality of the soil itself does not matter much – it thrives in poor sandy soils. 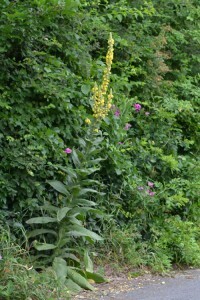 Common mullein was first introduced into the U.S. in the mid-1700’s, where it was used as a fish poison, in Virginia. It is now firmly established in the eastern US. The plant was also used as a medicinal herb, as a remedy for coughs and diarrhea and a respiratory stimulant for the lungs when smoked. A methanol extract from common mullein has been used as an insecticide for combatting mosquito larvae.